We have been having so much fun the last few weeks leading up to Christmas. 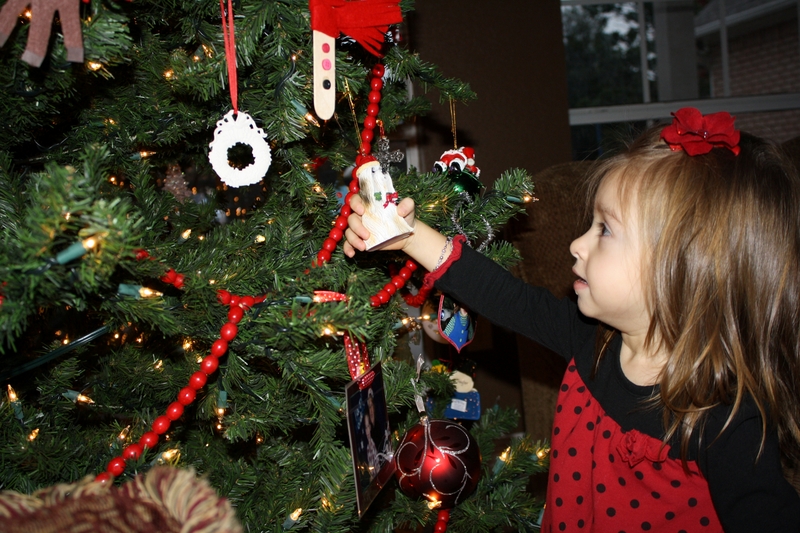 As always the kids LOVE decorating the house and putting up the tree. This is Leighton’s first Christmas that she has really been interested in what is going on. She loves our Christmas tree. 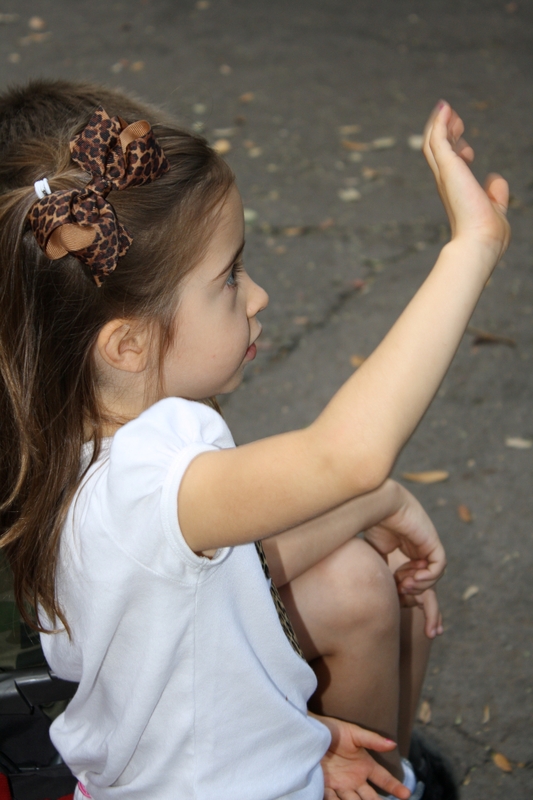 For the first week that it was up she would grab my hand randomly throughout the day…walk me to the tree…and say “Look, Look Mom!” First thing in the morning she would walk into the living room and ooh and ahh over the tree…so darling! The ornament Leighton picked out this year is a puppy dog with a santa hat. She carries it everywhere! 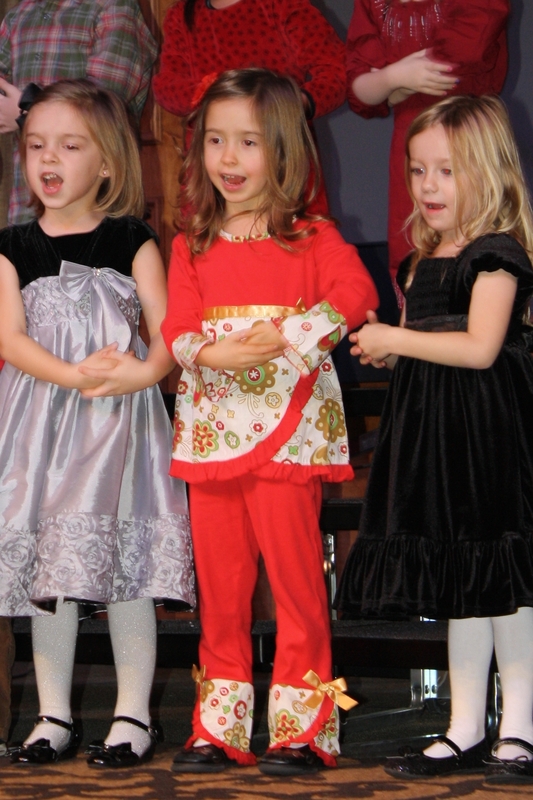 Christmas is magical when seen through the wonder of a little child! * One of our favorite things we have done in the last few weeks is attend The Journey to Bethlehem presented by the Church of the Cross in Grapevine. This will definitely be a yearly tradition! This was a wonderful reminder of what the Christmas season is truly all about. You walk in groups of about 20, over about 43 acres to “Bethlehem”. Along the way you visit Joseph’s carpentry shop. Roman guards come riding up on horses to harass you. You visit wise men with camels who are following a special star placed in the sky proclaiming that a king has been born this special night. You come upon shepherds with their sheep…as an angel appears in the sky. You finally make it to the stable with Mary, Joseph and baby Jesus. It was so well done…you felt like you were a part of it all. It was such a perfect start to this season in which we are trying to truly impress upon our children that JESUS is the reason for the season! It brought up great conversations with each of our kids. Christmas is a celebration of Jesus…our savior! *Carter got to pick an angel off the tree at his school for us to go shopping for. He got in the car and said, “Mom, the only thing this little boy put on his list for Christmas is shoes and socks. Is it because it is so cold outside and he doesn’t have any?” His tender little heart brought tears to his eyes…as I said yes. I went on to tell him that we were going to buy him shoes/socks…AND toys and gift cards, etc. We went immediately to the stores to shop and Carter kept saying over and over…”I LOVE making people happy…he is going to be so excited…I wish I could be there when he opens all of his gifts.” Christmas is about GIVING to those in need. *We spent one evening, along with 5 other families, serving food down in an area known as como…in the middle of Ft. Worth. 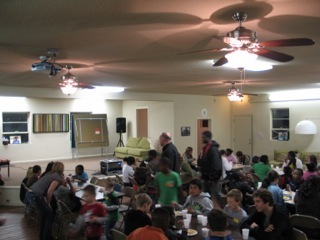 We ate, worshipped, served, and had fun with our new friends. 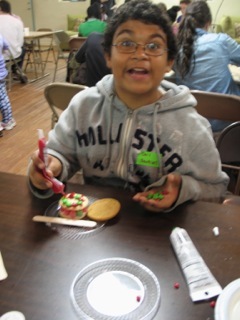 We brought cookies for them all to decorate which was the hit of the party. 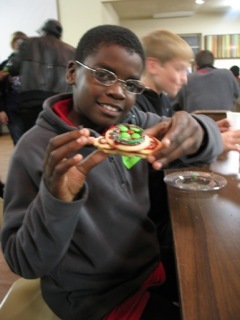 They loved making cookie masterpieces:). Christmas is about SERVING others! 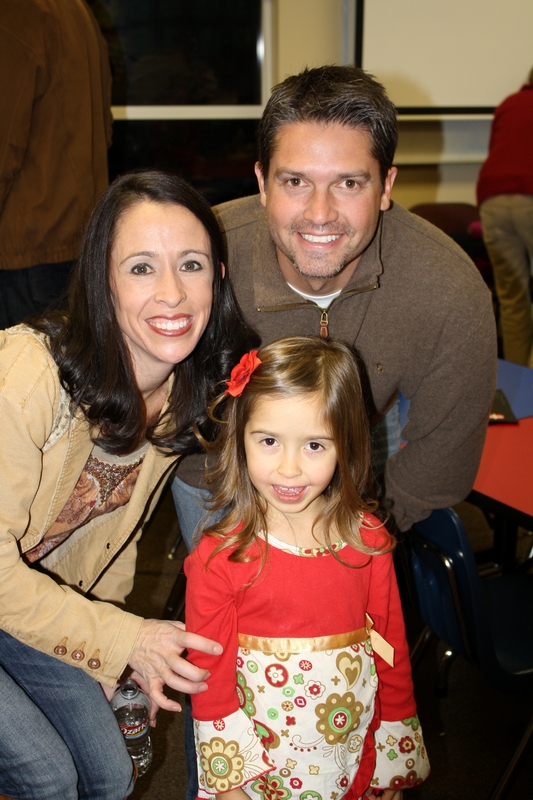 *Caroline had her school Christmas program last week…Our Best Gifts. 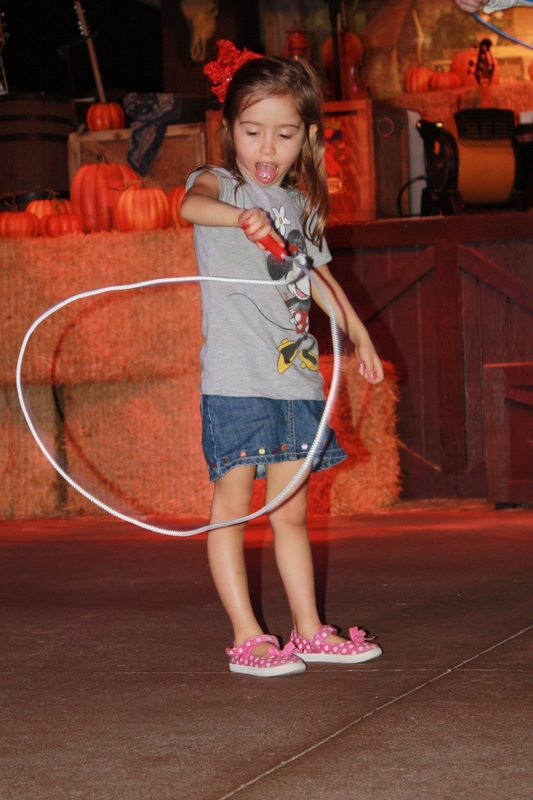 She had been practicing her song…and was super excited to perform for us! Her class sang “Go Tell it on the Mountain!” It was so sweet to see all of these precious children singing their hearts out to God. 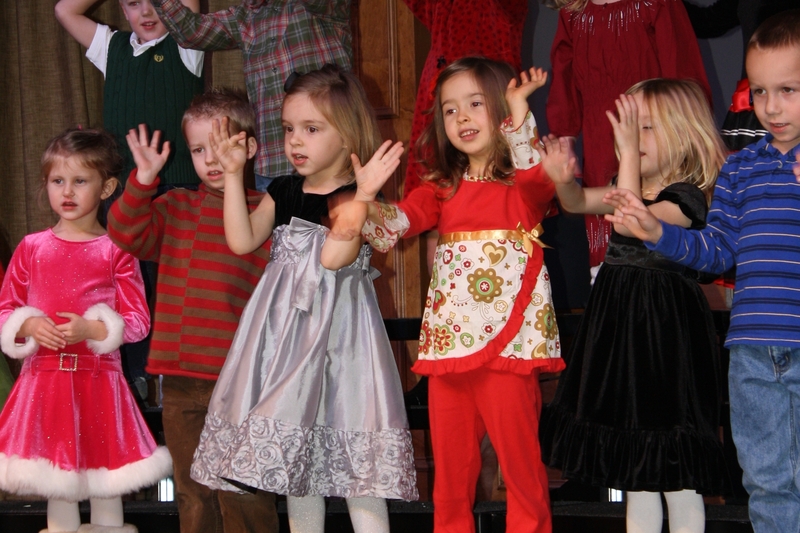 Christmas is about PRAISING the Lord in song and worship. *One of the sweet girls that we have babysit the kids, Mallory, called and asked if she could come bring the kids their Christmas present. 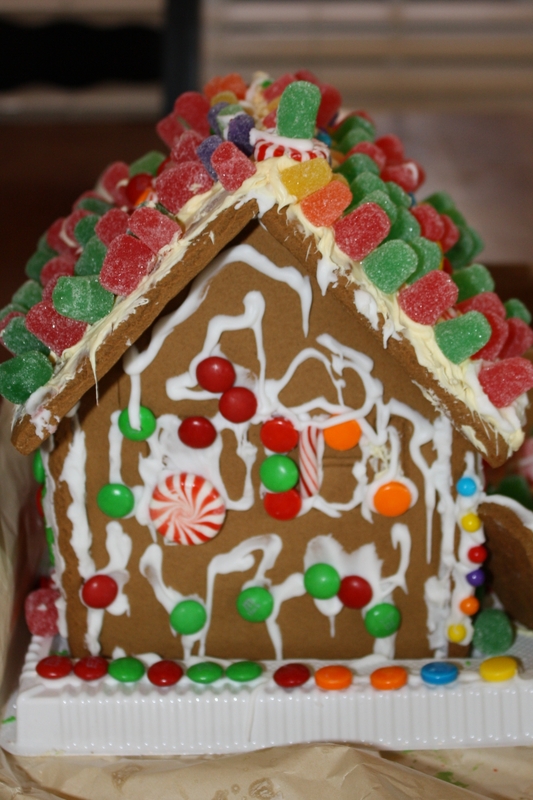 She brought over a gingerbread house for them to decorate and let Ben and I go shopping! HOW NICE IS THAT??? 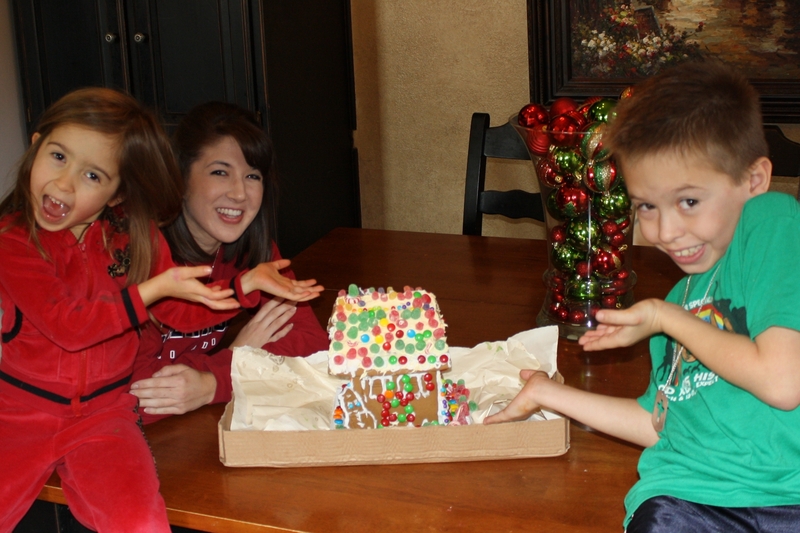 The kids were so excited to see her walking up with a gingerbread house…this was their first time to ever decorate one! Christmas is the kindness of friends. 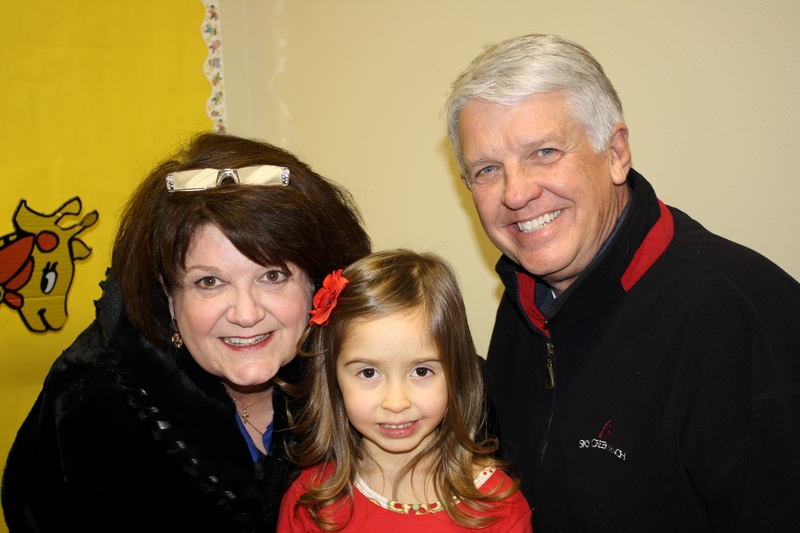 *Our niece Cassidy was in A Christmas Carol at church. 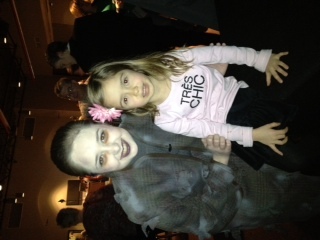 She had been working hard in her role as Scrooge’s partner Jacob Marley’s wife, who returned from the dead. Caroline and I went to see her perform on Sunday. 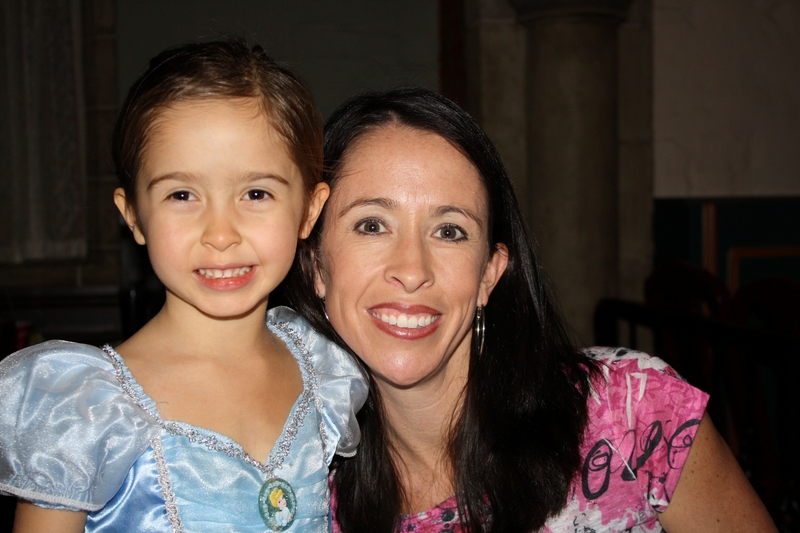 She did an excellent job…I was so proud of her! After it was over the student minister was talking about how this play is a story of redemption. Christmas is a reminder of our own redemption through Jesus Christ! 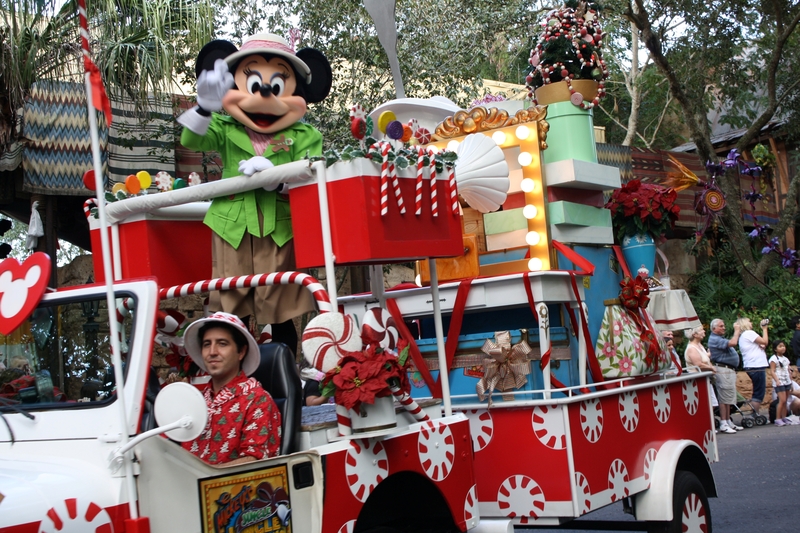 A week and a half left until Christmas…and a lot more fun activities left to do! I love this time of year! The day that Ben and I have been talking, planning, and whispering about for months had finally arrived. 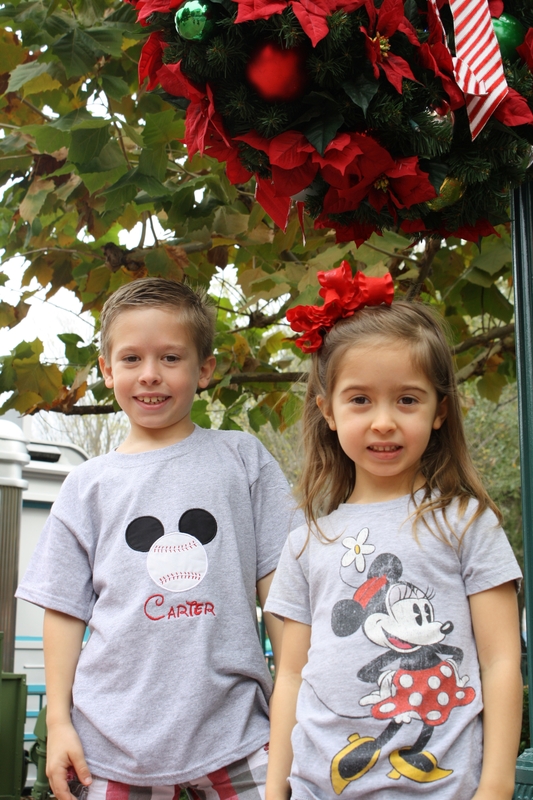 We couldn’t wait to SURPRISE Carter and Caroline with a trip to Disney World! I came home from work around noon…Caroline was surprised to see me home so early. 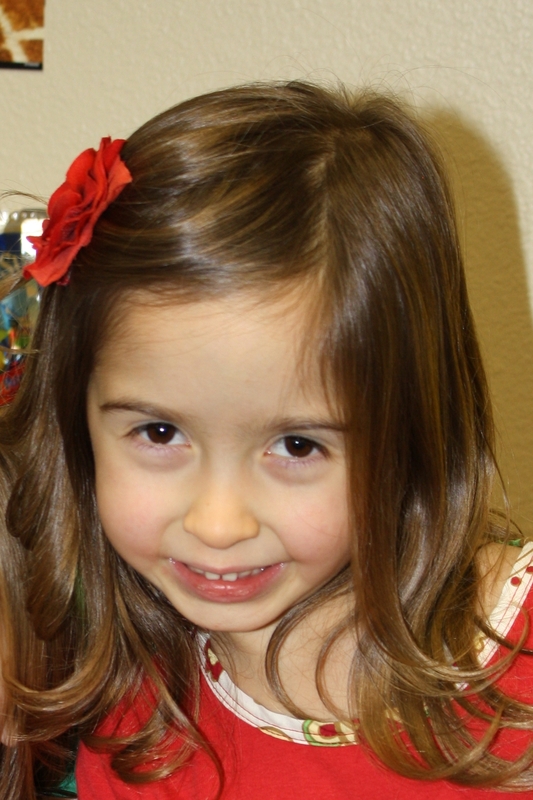 Ben and I told her that we were going to go somewhere fun like Chuck E Cheese. We went and checked Carter out of school and started driving toward the airport. Ben started talking about wanting to take a trip, etc. 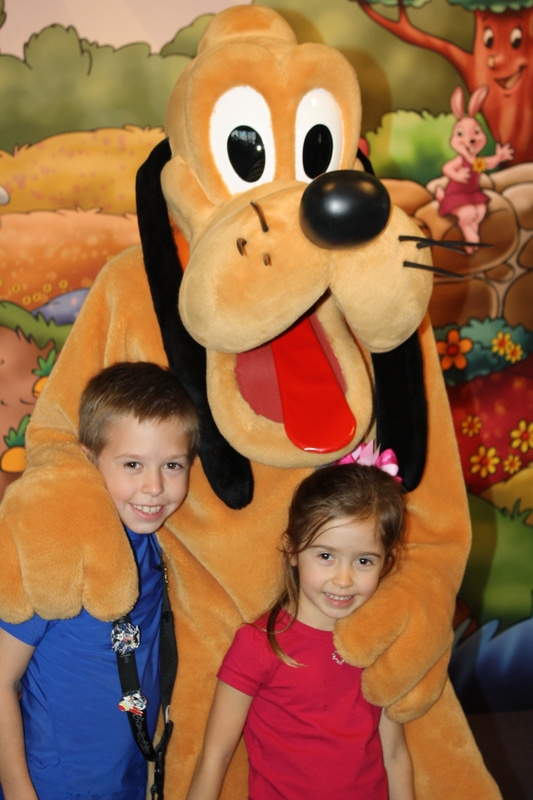 We finally told them we were going to Disney World! Carter was thrilled…and Caroline was a little worried that we would be sleeping on the plane like we did when we went to Brazil:). After we explained everything…they screamed and danced for at least 30 minutes. 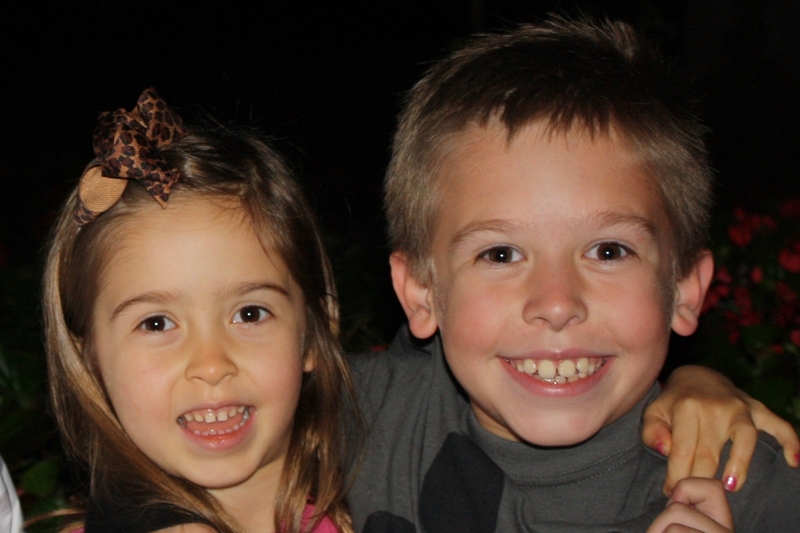 These precious smiles were a constant on their face. We arrived in Orlando at 6:45pm and headed to our hotel, All Star Movies Resort. 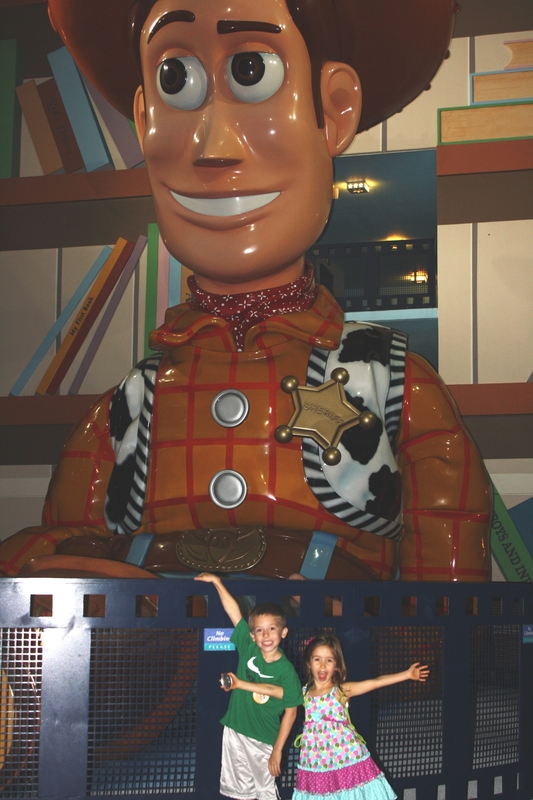 We stayed in the Toy Story building and the kids LOVED all of the HUGE icons of Woody and Buzz. We ate dinner at the hotel, walked around, and went to bed early to get ready for the next BIG day! 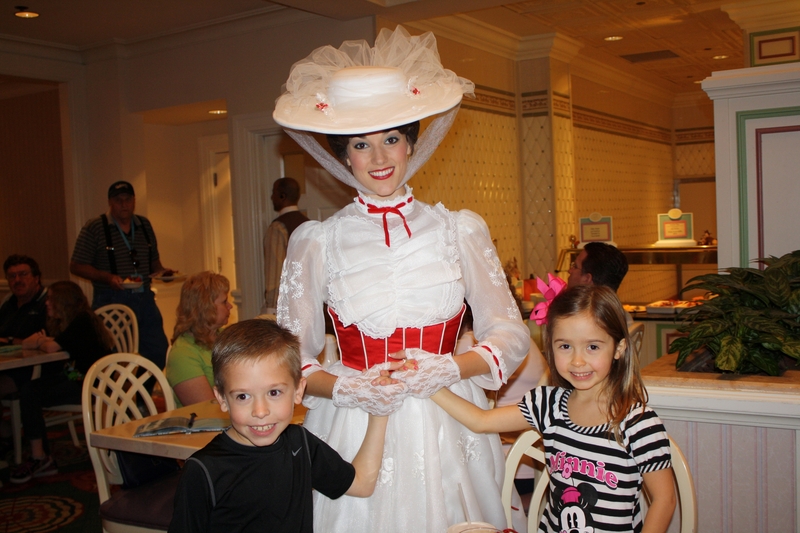 Mary Poppins is Caroline’s favorite movie…so she just had to ask her, “How did you keep that tall black lamp in your little bitty bag?” “It’s a magic bag of course,” Mary Poppins replied. We had ridden all of our favorite rides 2-3 times because there were no lines. So we finished up at the park by 4pm and headed back to our hotel. We ate dinner…relaxed in our room…and then took the kids out for a night swim. 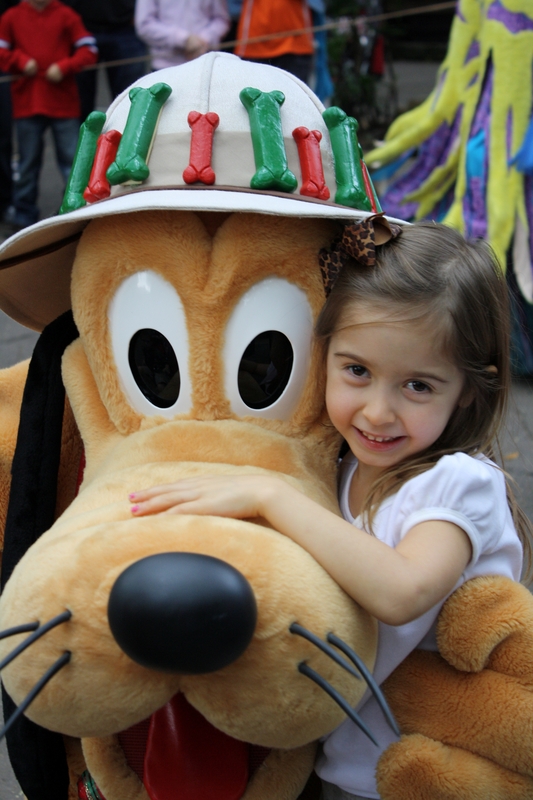 We stopped and had lunch in Mexico (where the kids discovered churros)…and then we toured all the rest of the countries. 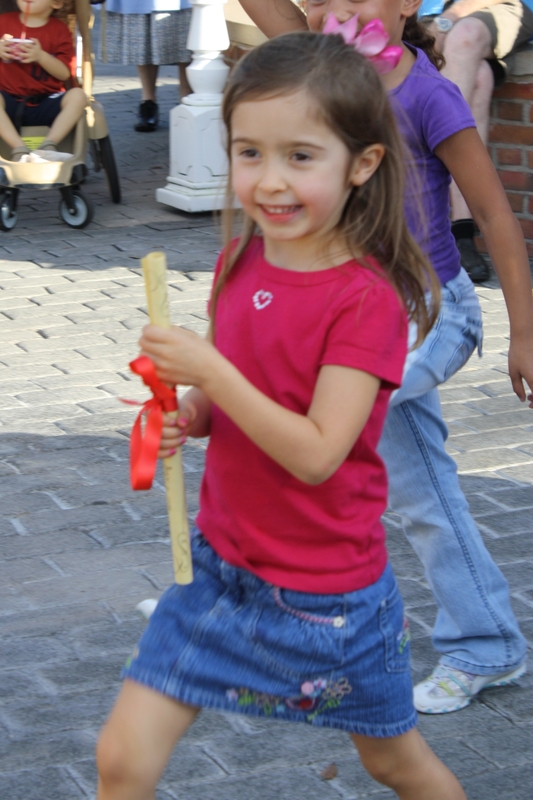 We really enjoyed visiting each country and walking into all of the little shops. When we got to America they were beginning a drama presentation called The Sons and Daughters of the Revolution. They asked for volunteers and Caroline ran up to the front. 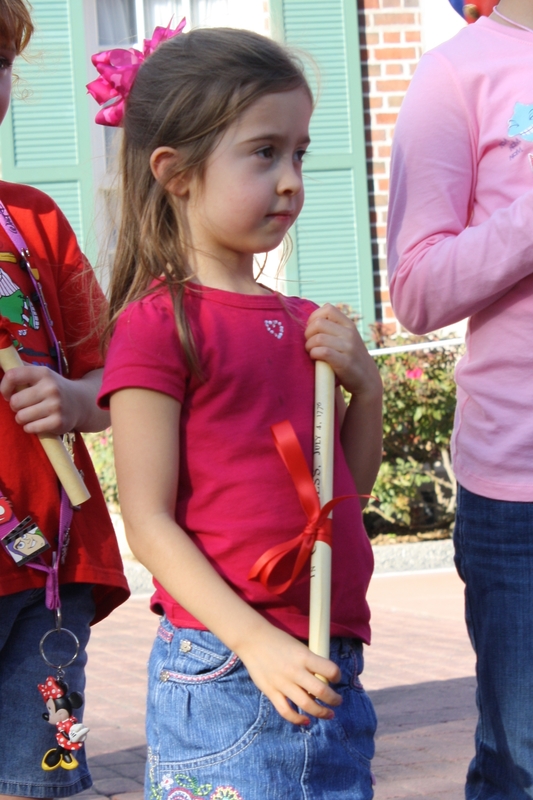 She got to keep a copy of the Declaration of Independence that she marched with. 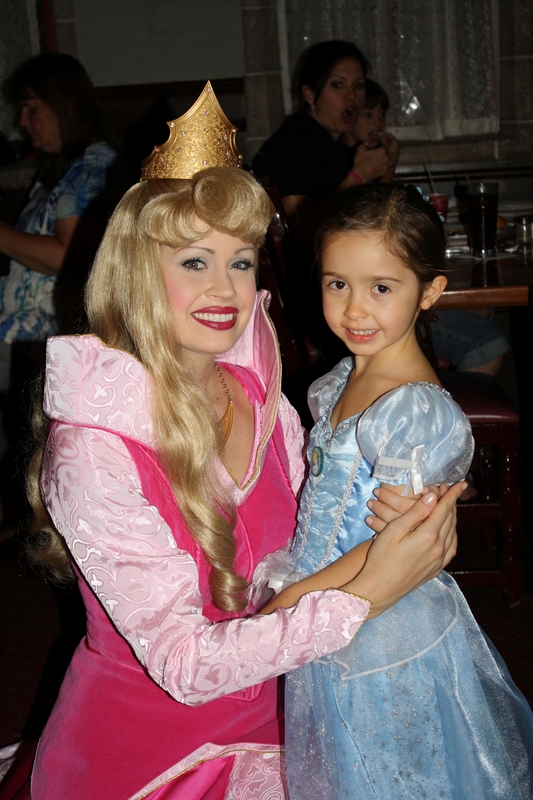 After we had toured all of the countries we headed to Norway where we had a princess dinner at the Akershus Royal Banquet Hall. 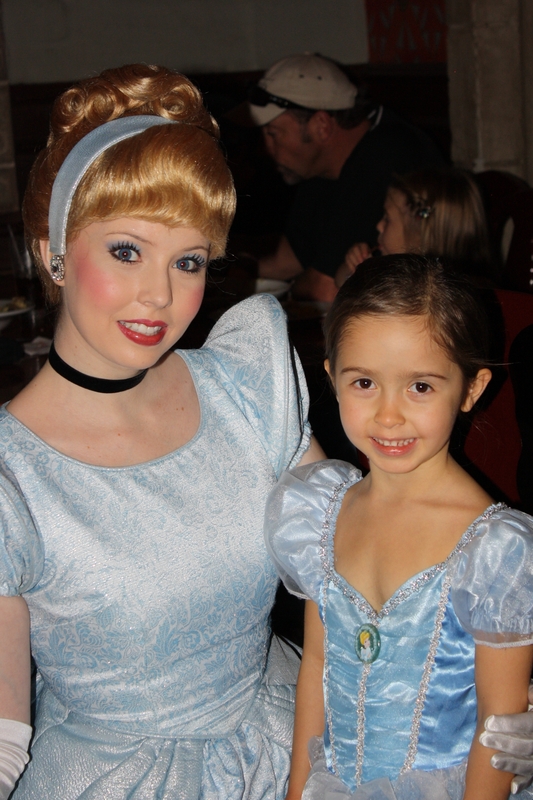 Caroline got dressed up as Cinderella…and we all loved seeing the princesses. Caroline was at such a perfect age. 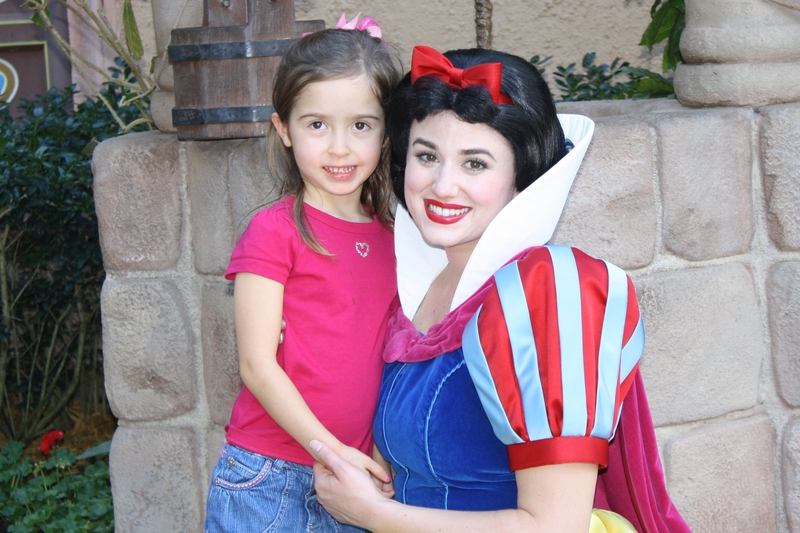 She believes all of the princesses are real…and really live there. As each one came to our table she would have some big question/conversation with them. To Cinderella she asked if her step-sisters were always mean. 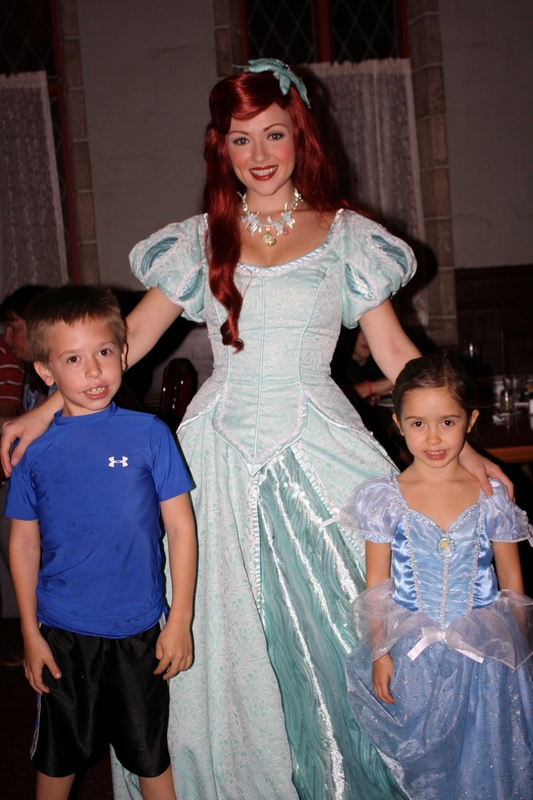 To Ariel she wanted to know if she missed being a mermaid because now she couldn’t swim with Flounder. To Belle she wanted to know if she was scared of the Beast. They were all so engaging…and Caroline beamed the entire night! After dinner we had 2 sleepy kiddos. We headed to the bus to go back to the hotel. 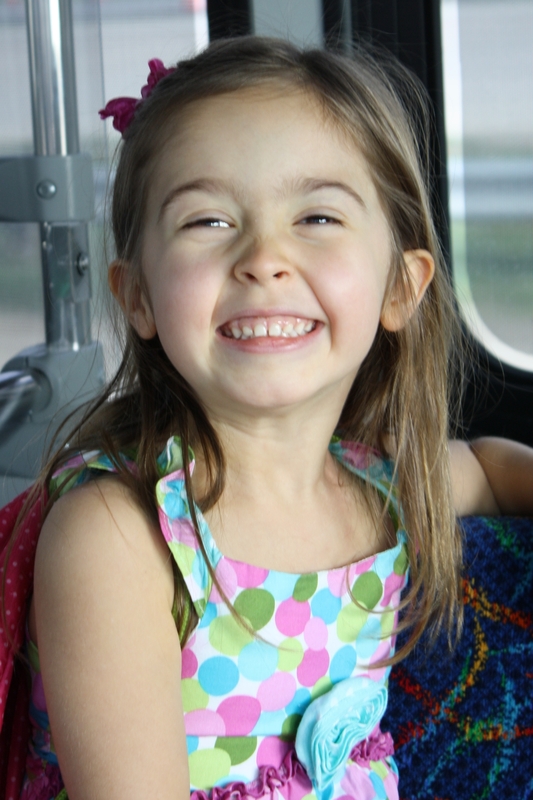 While we were riding the bus, the driver turns on the light and makes this announcement, “Ladies and Gentlemen we have a very special Disney Royal Princess riding with us tonight!” Caroline sits up and looks around and then we all realize he is talking about Caroline! 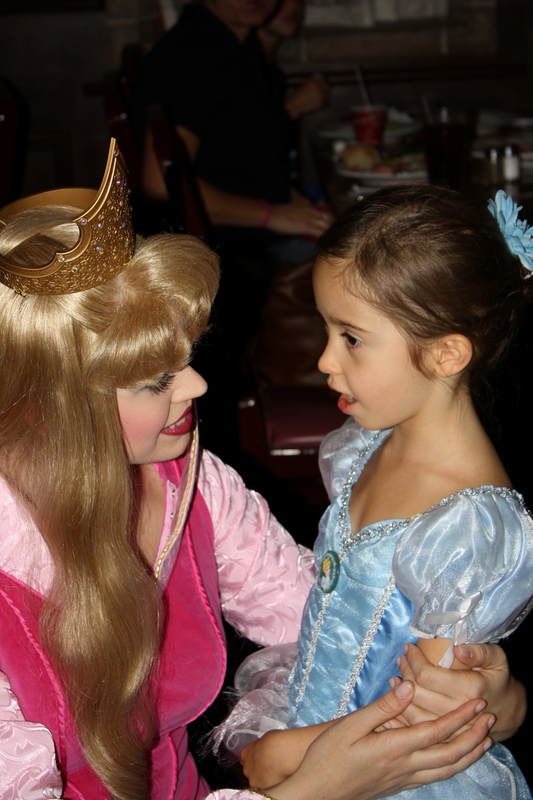 Then he proceeds to say, “Cinderella while you were out to dinner the mice have taken over your castle…do they need to be beheaded?” She got a kick out of being treated so special all evening…precious memories! 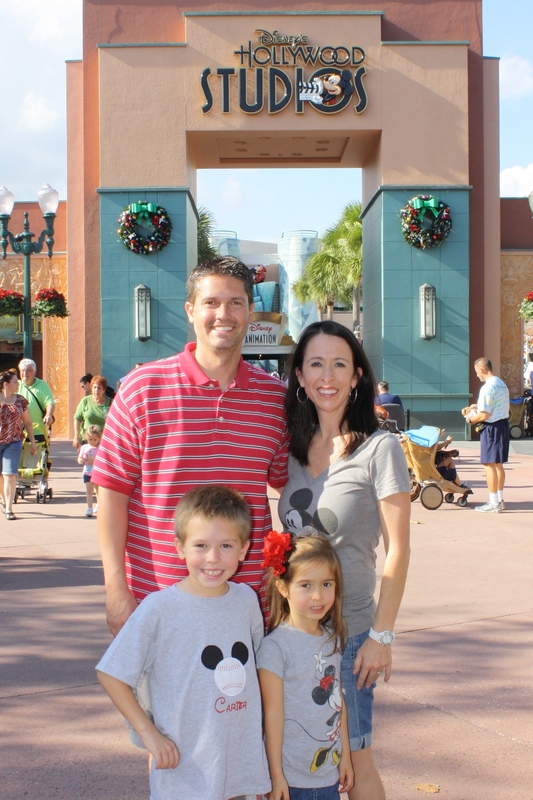 We woke up Thursday morning and headed over to Hollywood Studios. We rode the Star Wars ride first…and then headed over to the Toy Story ride. This was one of the kids favorites. 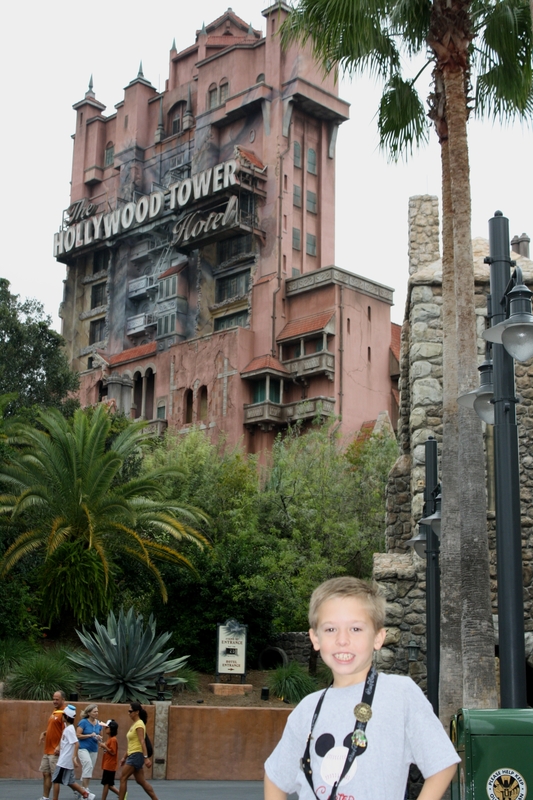 We watched the Indiana Jones show…and then Carter wanted to ride the Hollywood Tower of Terror. 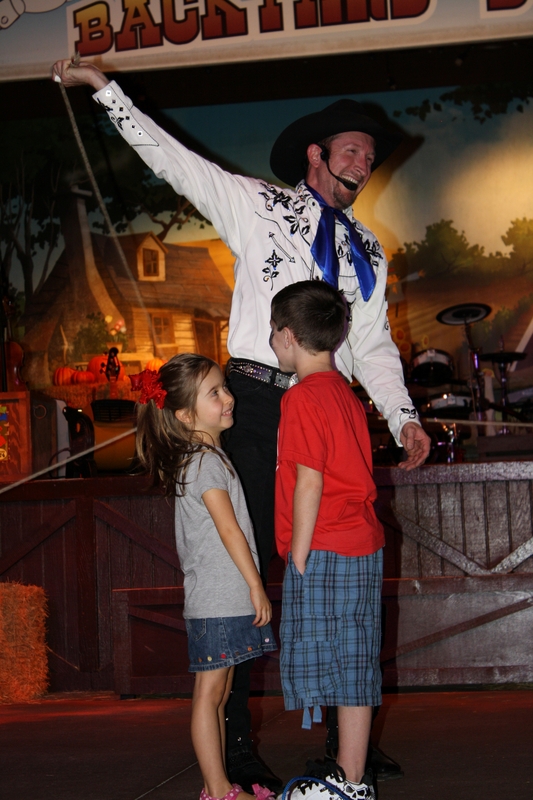 I took Carter on that crazy ride…while Ben and Caroline waited on us. We got off and I was feeling a little queasy…and Carter begged to ride it again and this time Caroline had worked up the courage to ride it as well. So I got back on that crazy ride with the two of them…and had a blast. Somehow Ben managed to skate by NOT riding it either time:). 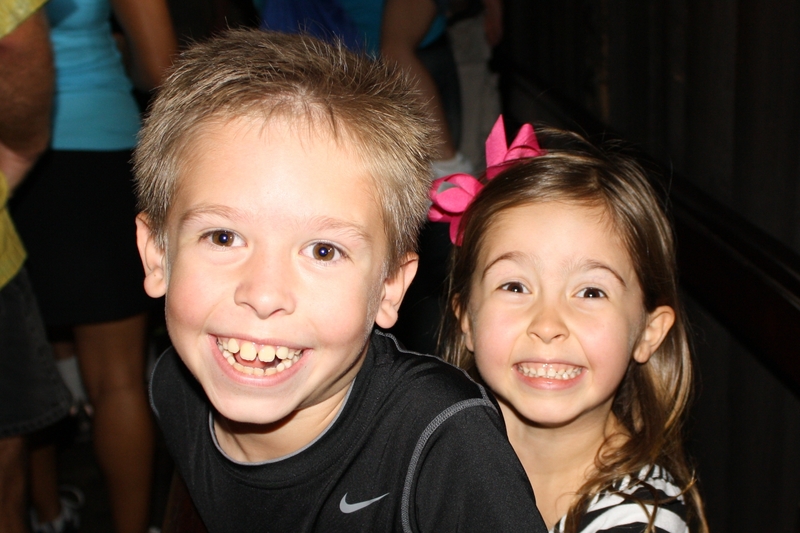 Carter and I went on the Aerosmith rockin’ roller coaster…which was AWESOME!! We loved it! We headed back to the hotel around 3pm…took naps…and got ready for our fun dinner plans. 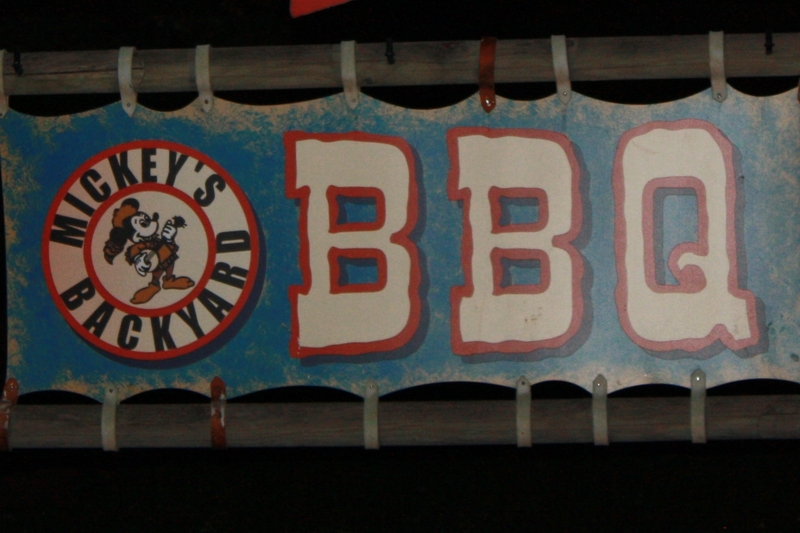 We were so excited to go to Mickey’s Backyard BBQ for dinner. 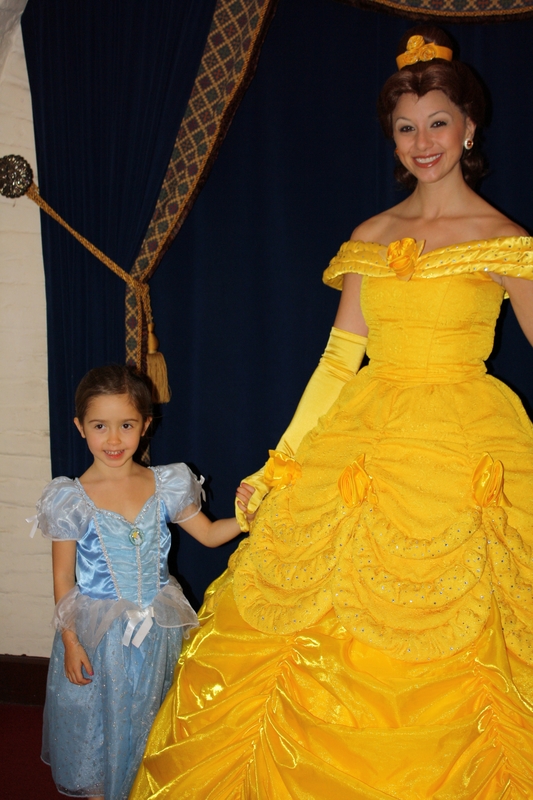 It was held at the Fort Wilderness Campgrounds. 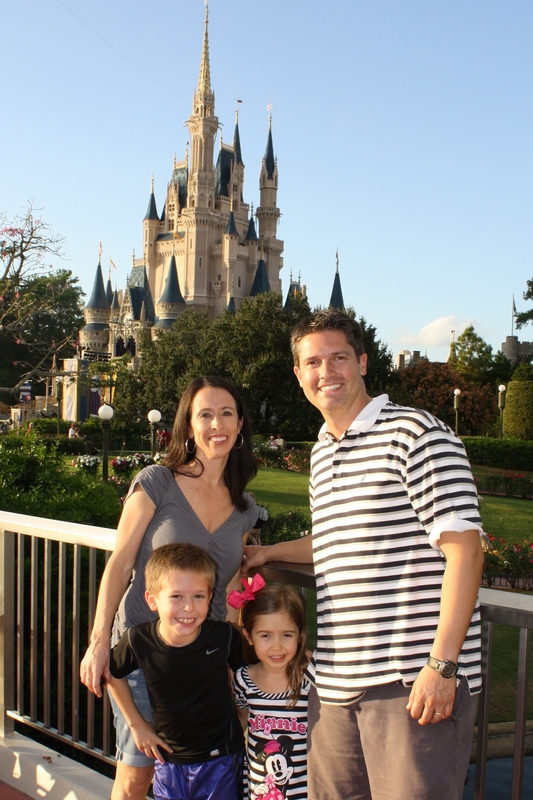 We took a bus to Magic Kingdom and then took a boat over to the campgrounds. The kids loved being on the boat! At the outside pavilion they were serving up all you could eat ribs, brisket, potato salad, corn on the cob…had an open bar…and all you could eat ice cream. 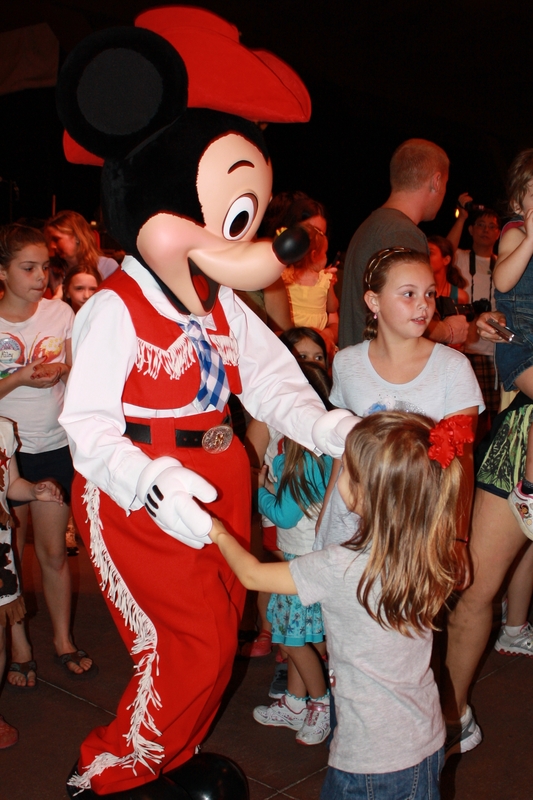 Mickey, Minnie, Goofy, Chip and Dale were all dressed in their finest western clothes. 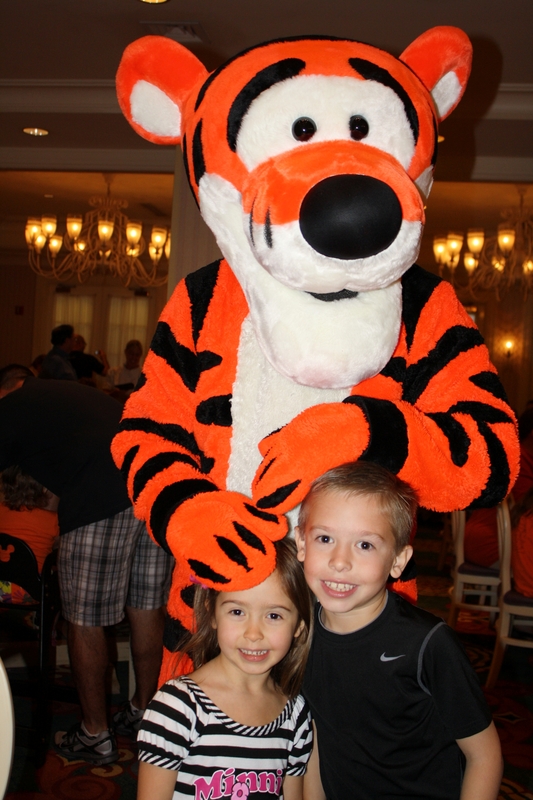 The kids danced all night to a live band…and had a ball. 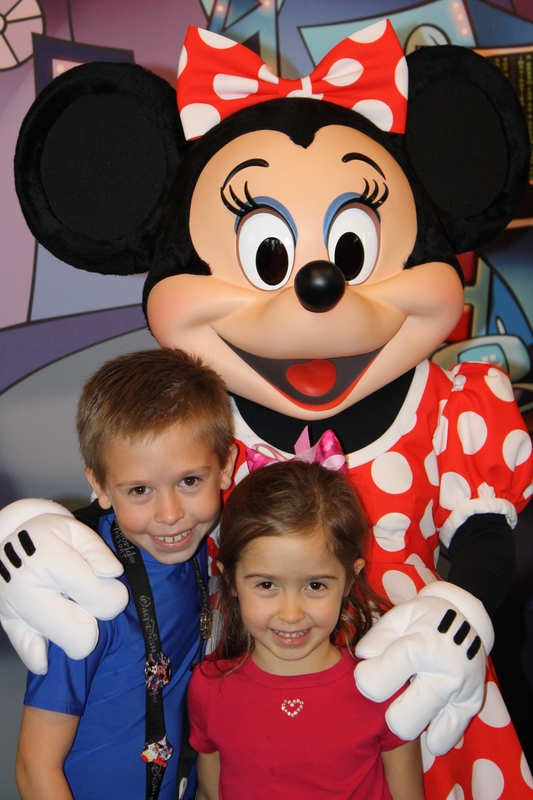 Caroline was mesmerized by Minnie and Mickey. She followed them around all night…holding their hands and dancing with them. It was the most precious thing…complete adoration in her eyes! Towards the end of the night they had a professional roper perform on the dance floor. He was pretty amazing! He asked for one boy volunteer…and then that boy got to pick one girl volunteer. He picked Caroline. She jumped right up there in front of all 400 people. 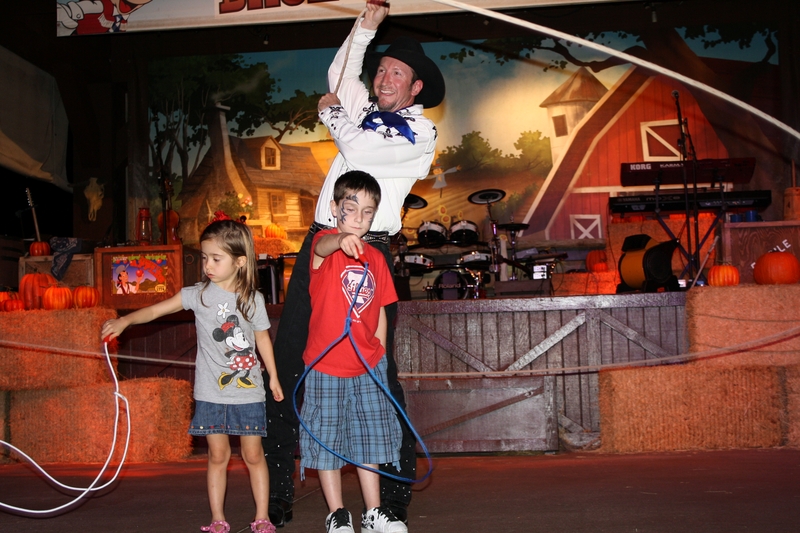 He taught her how to rope…and then was roping around the two of them. She was a little doll up there! We headed back to our hotel on the boat. We could see the Magic Kingdom Fireworks from the boat. A perfect ending to a really fun night! We had been excited all week to go to Animal Kingdom. 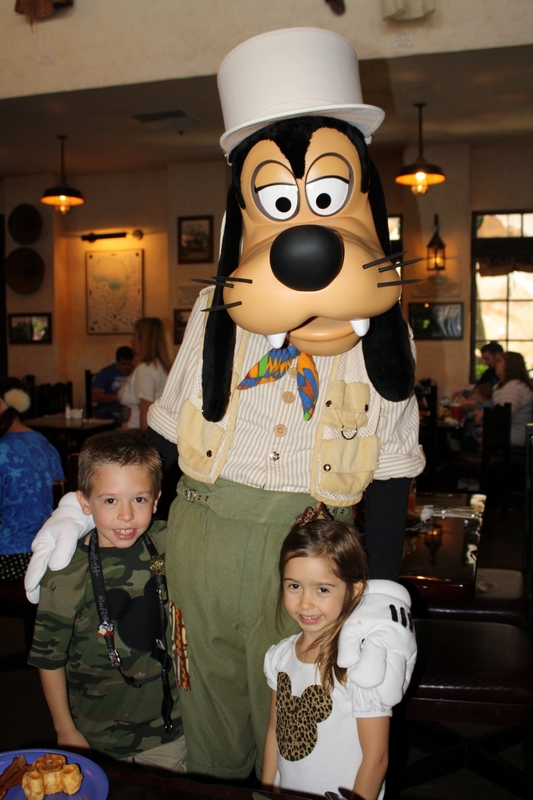 We started our morning out at the Tusker House for breakfast…where we got to see a lot of characters! 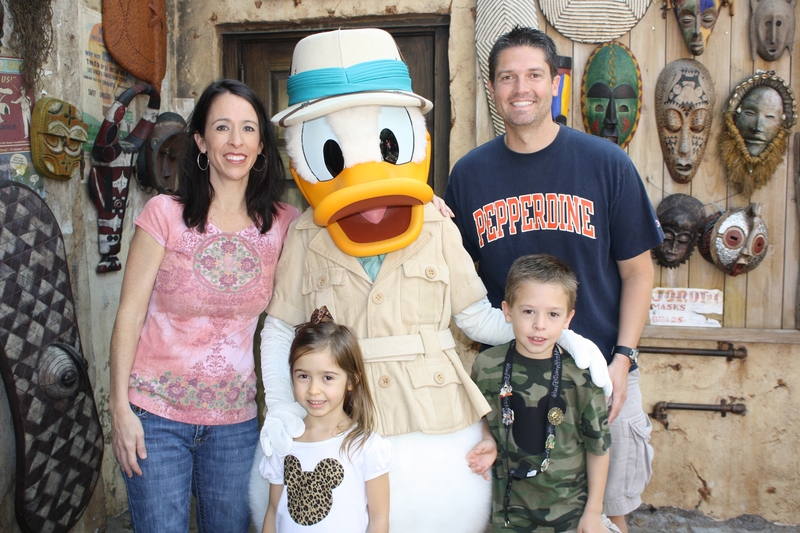 We went on the Kilimanjaro Safaris…and then headed over to Expedition Everest. Ben and Carter rode Everest twice while Caroline and I played around in DinoLand. She is a dare devil and was disappointed that she wasn’t tall enough to ride Everest! Then we all went to see Finding Nemo-the Musical…which we LOVED! It is one of our favorite Disney movies. 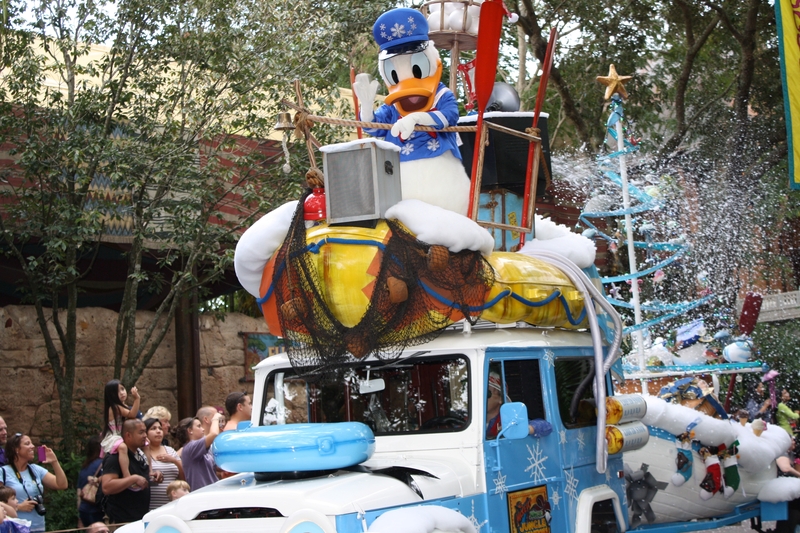 We got to watch the Flights of Wonder bird show…which was very cool! The kids talked us into riding the Kali River Rapids…where you are guaranteed to get soaking wet! Being that there was no one at the park we rode the rapids twice in a row. We didn’t even get out of the ride…the worker just kept us buckled in and sent us on through again. (I cannot mention it enough how WONDERFUL it was that the parks were so empty). 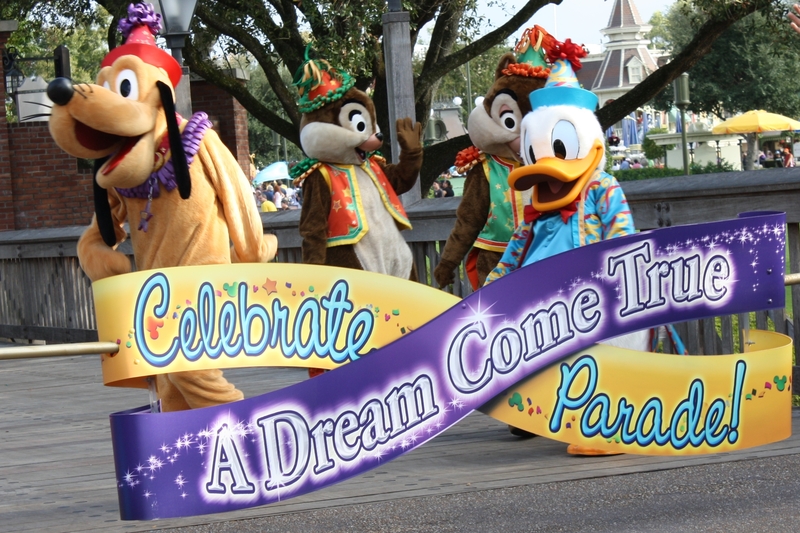 When we were all nice and wet we headed to watch the Jammin’ Jungle Parade. 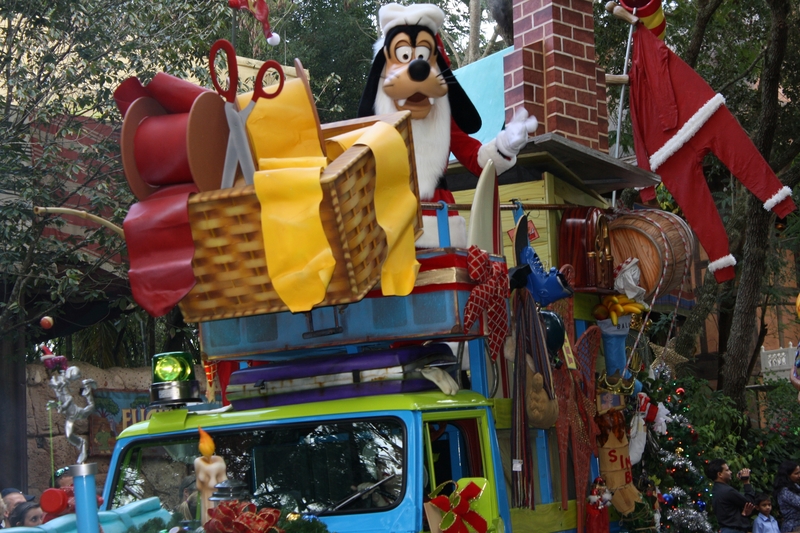 We loved it that everything was decorated for Christmas…so fun! 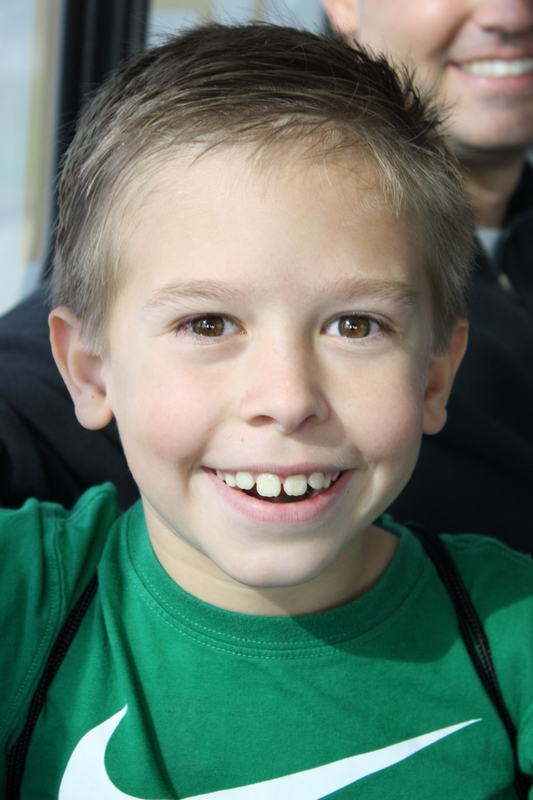 This may be my favorite pic of the whole trip…priceless! After the parade we ended the day at It’s Tough to Be a Bug. 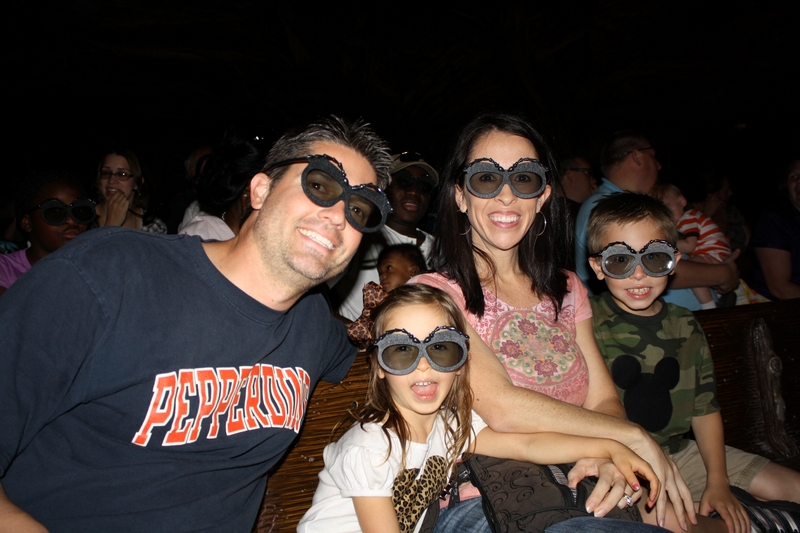 It is a 4-D show in the bottom of the Tree of Life…it was fantastic…we laughed and laughed! We went back to the hotel and had dinner. Then we took the kids to watch Toy Story 3 on the big screen outside by the pool…they loved it! For our last day we told the kids we could go back and ride whatever they wanted to. 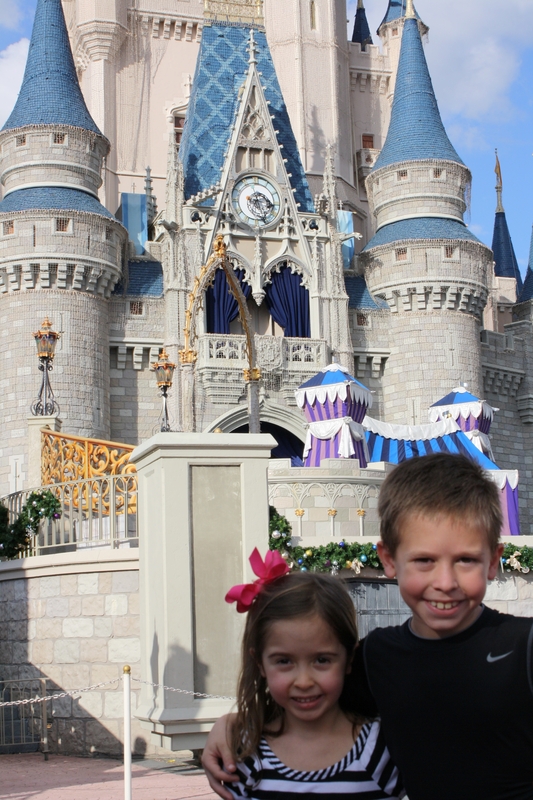 They wanted to start off at Magic Kingdom and ride Splash Mt and Big Thunder Railroad…over and over. (Still no one at the park) Then we headed over to Animal Kingdom to ride Mt Everest and the Dinosaur ride. By 3pm they were ready to head back to the hotel. 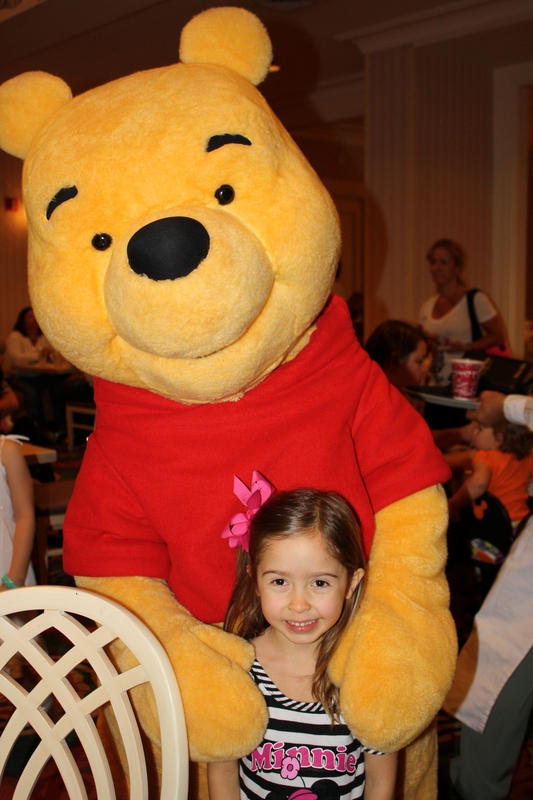 We went back to take naps…and then headed to dinner at Epcot. We walked through all the countries again…and then had dinner in Morocco. We stayed to watch Illuminations…which was fantastic. A perfect ending to a perfect vacation! 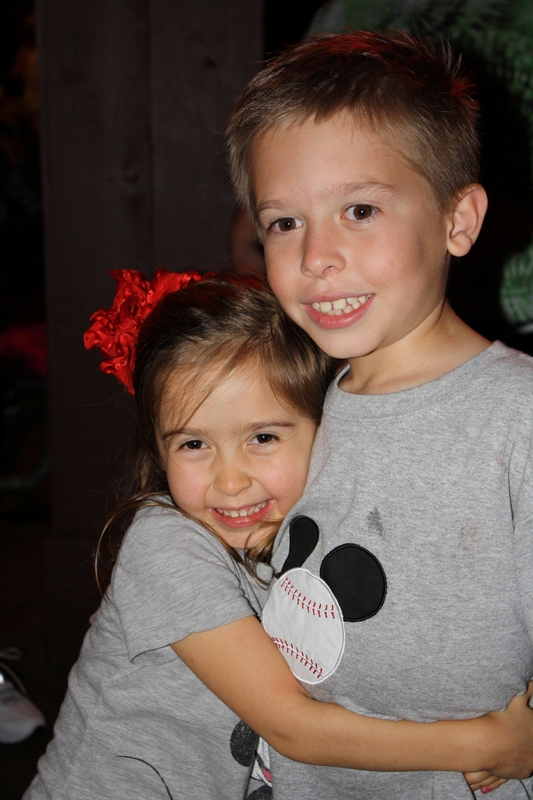 These sweet precious kiddos…with their darling smiles…was what this trip was all about! You couldn’t wipe the smiles off their faces during the entire trip. 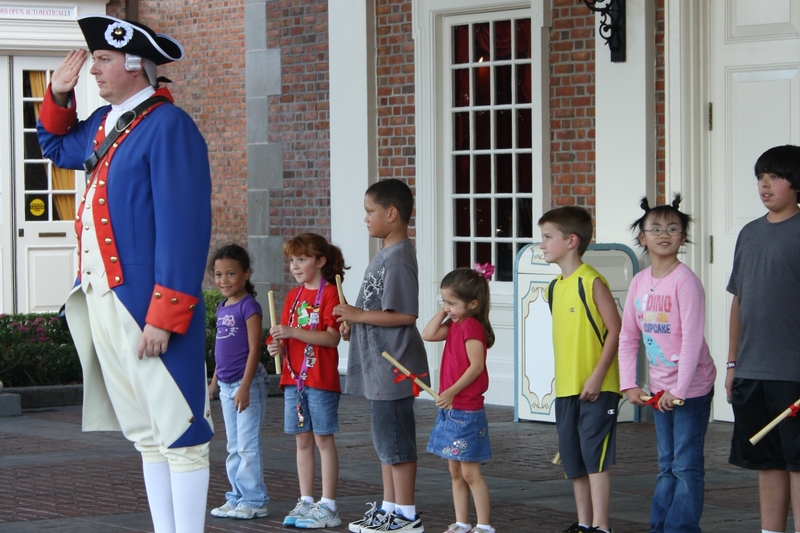 We were relaxed and went at their pace…when they were ready to head home we left the park. 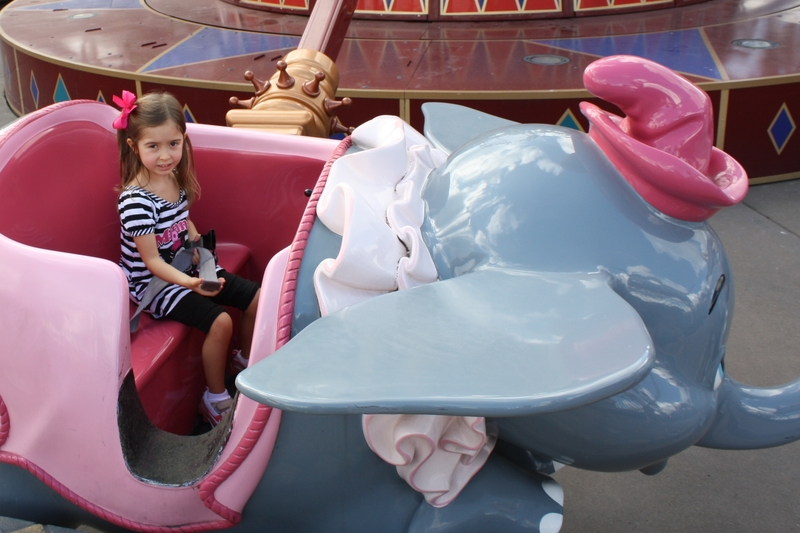 When they wanted to ride something 5 times in a row…we jumped on. The weather was 72 and BEAUTIFUL. The parks were EMPTY. 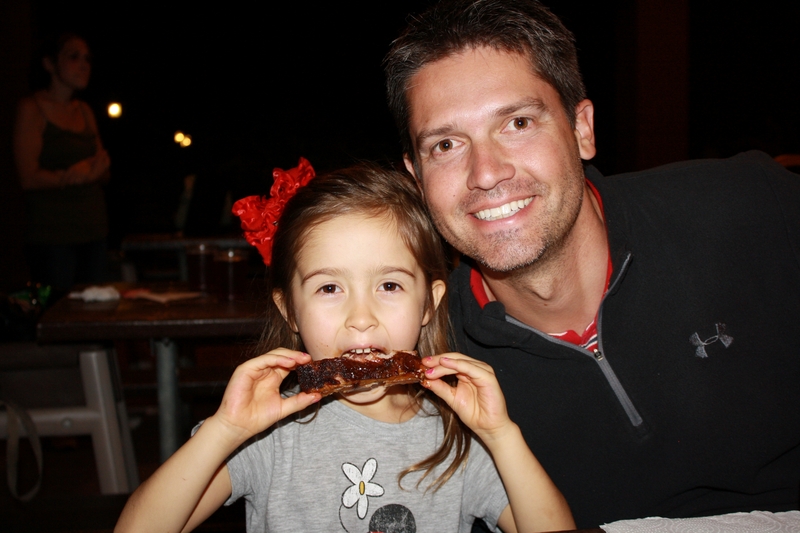 We laughed….played…ate and ate…and LOVED hanging out together! 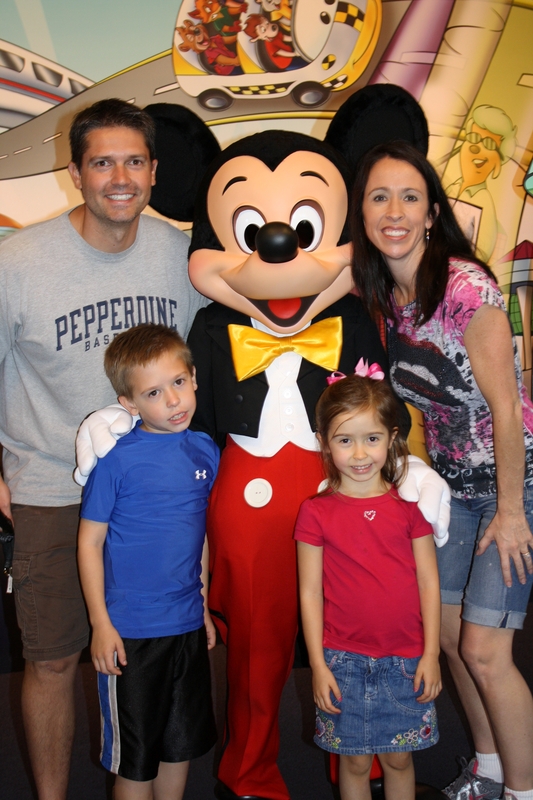 God blessed us with great family time…and memories that will last a life time!